Since my baptism last week, I have been thinking about how grateful I am and processing what it even means to be baptized. But first, thank you to everyone who came to support me and to those of you who spoke such kind and affirming words. And, thank you to those of you who cheered from afar! I am so blessed to have each of you in this life with me. I know you’ve got my back and I want you to know that I have yours too. We need each other. One of the most overwhelmingly beautiful things that I was reminded of through this process is how supportive the Inland Church family is. To be clear, this is something I never forgot, but it was displayed to me in a brand-new way just how incredible this little “fam” is. 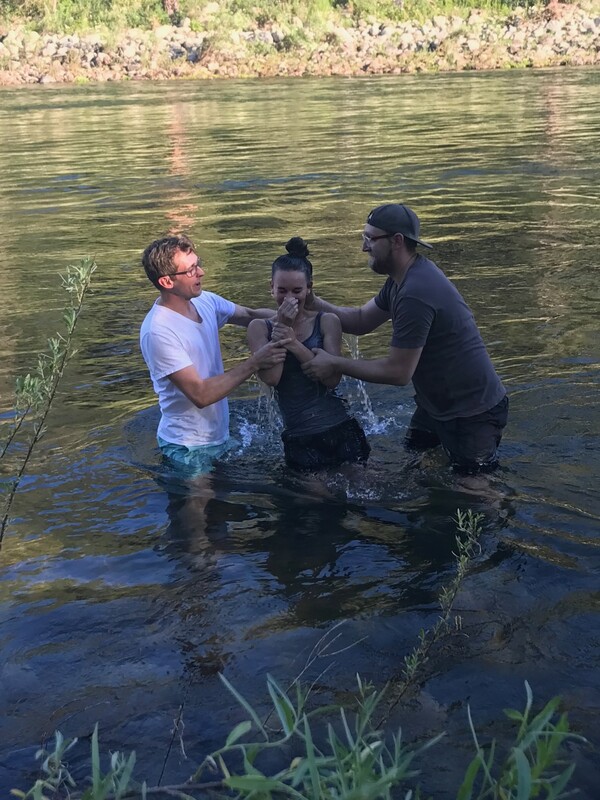 I have a picture of the moment I was baptized and I am so thankful for it, but what I really wish I had is a photo of all of you standing on the river bank cheering me on while I got dunked. That is an image I will never forget. Thank you, IC. “… having been buried with him in baptism, in which you were also raised with him through faith in the powerful working of God, who raised him from the dead. And you, who were dead in your trespasses and the uncircumcision of your flesh, God made alive together with him, having forgiven us all our trespasses” (Colossians 2:12-13, ESV). As Jon mentioned last Sunday, baptism is about declaring that, “I’m in.” Well, Inland Church, I’m in. I am so thankful to have been given the chance to publicly declare that to all of you. This thing we talk about and sing about together on Sundays and other days throughout the week, I’m in. Granted, I have been “in” for some time now, but now I’ve finally gotten to display the death that Christ has raised up (and is raising up) to life in baptism. God made us alive! We were once dead in our trespasses and he has brought us life and togetherness with him. What a joy! It is a blessing to be in this journey together. We do need each other. I need you all to remind me of my new life in Christ and I want to do the same for you. I’m in and I know you’re in with me because you all told me last Sunday. Let’s keep encouraging each other and cheering each other on, IC, and let’s be reminded of all that Christ has done for us.